All photos by Harry Leonard Imagery. 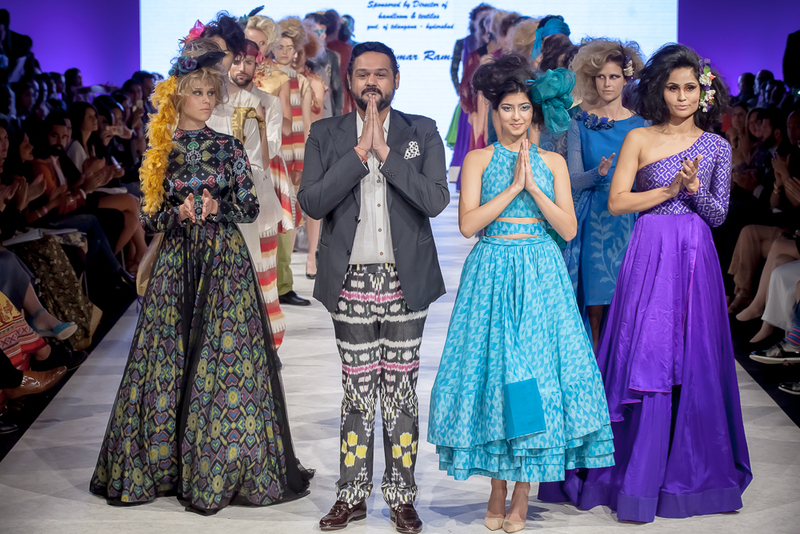 It is such a thrill when an international designer of Shravan Kumar's caliber returns to Vancouver Fashion Week (VFW) season after season. Over time, you have the opportunity to develop a friendship and a deeper love of their work comes as you learn more and more about their journey. There is time to schedule in-depth interviews or to just enjoy a casual breakfast after the shows are over to catch up on each other's lives. As my friendship grew with this talented designer, a funny side story developed. I found out this season I have been mis-pronouncing his name since day one. Why he didn't correct me, I don't know. But I am determined to get it right from now on. And - I have still not figured out why he uses Kumar in the runway program and Ramaswamy on Facebook. No worries, I'll ask that next time. I also think it's time for me to take a trip to India! I'm feeling the call. This season Shravan offered two pop-up shops. For years now I have been wanting to own a traditional saree. On a side table, I noticed a beautiful one in black and gold with burgundy trim. It seemed to be calling my name. I kept going back and looking at it, so finally Shravan offered to help me try it on. Nirvana. It was meant to be. I could not have felt more beautiful wearing it on Saturday at VFW (image below). I knew I looked fabulous as people kept stopping me to take photos. Here is an interesting fact. DID YOU KNOW - it takes about three months to weave a quality saree? I have written on Shravan's collection over several seasons - F/W 15 (solo article) - S/S 15 - F/W 14 - so don't want to repeat myself too much here.. At his very core, the designer is first and foremost a humanitarian who cares greatly about social and ecological issues. 80 weavers are employed to create his beautiful fabrics - helping to raise their standard of living - and last season's collection was created in honour of India's gypsies who have a very hard life. Shravan also helps to raise money in aid of the Indian Liver Foundation. He uses vegan silk, which means the moth is allowed to escaped before the threads are collected. A much more difficult process, but an important one for him. He is also a vegetarian. Many of the fabrics for S/S 16 were created using a very labour-intensive weaving technique call Ikat or "painting the loom." I'm still exploring the intricacies of this technique, but here is a basic description from Wikipedia - "Ikat, or Ikkat, is a dyeing technique used to pattern textiles that employs a resist dyeing process on the yarns prior to dyeing and weaving the fabric. In ikat the resist is formed by binding individual yarns or bundles of yarns with a tight wrapping applied in the desired pattern. The yarns are then dyed." Shravan also shared that he has been slowing changing the collections he brings to VFW. At his first appearance, the designer chose to show an all Indian aesthetic. That has been shifting each season. For S/S 16, the aesthetic was about 80% Western influenced to make it more accessible to a wider North American market. S/S 16 was a great mix of brightly coloured men's and women's looks in both casual and evening wear. Turquoise is my absolute favourte colour, so I was thrilled to see it prominent on the runway. My favourite women's look was the turquoise skirt and crop top on the model to the right of Shravan in the top photo. For menswear, it was the turquoise/purple look on the male model with the beard. There are many others I love as well, but those two in my favourite colour made me smile. Congrats to Shravan Kumar on another fabulous runway showing! for more information on this designer or how to order your own fabulous garment, go to https://www.facebook.com/shravansstudio.